Test strips designed to detect the presence of fentanyl in drug doses may help to encourage safer drug consumption, new research suggests. Distributing such strips is a popular policy proposal among harm-reduction advocates, but has lacked substantial experimental evidence to support its efficacy. A new study, authored by a group of scientists from Brown University, Boston University, and the University of British Columbia, provides support for the idea that test strips could be a potent tool in the fight against fentanyl. Fentanyl and its analogs are synthetic opioids, meaning that they bind to the same receptors in the brain as heroin and prescription opioids, but are artificially synthesized in laboratories instead of being derived from natural plants like the poppy. Huge quantities of the drug are now mass-produced in China, then shipped to the United States by mail or smuggled over the southern border. Synthetic opioids are generally much more potent than heroin or morphine, and therefore are also much more likely to induce respiratory arrest and death. Their introduction to the U.S. market over the past half-decade or so has had a stunning impact: fentanyl now outpaces every other drug among causes of overdose death. Because fentanyl is so potent, it is generally not taken by itself (although some drug users could be abusing diverted medical fentanyl patches.) 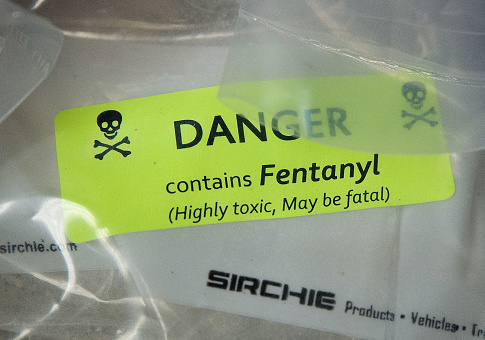 Rather, the majority of fentanyl overdoses are due to adulteration of other drugs—heroin, but also cocaine and synthetic marijuana. Because of the complexity of the drug supply chain, most users do not know the chemical composition of what they end up taking: heroin, e.g., may have been stepped on with fentanyl at several points along its journey from farm or factory to user. What this all means is that users may overdose because they take what they think is a dose to which they are accustomed, but which actually is far more potent because, unbeknownst to them, it contains fentanyl. As such, there is major harm-reduction potential in giving users the means to determine what is actually in the drugs that they are taking—if their heroin contains fentanyl, users can adjust their dose or avoid taking the drug altogether. How can users know if their drugs contain fentanyl? One answer is fentanyl test strips: simple, cheap ($1-$2 per strip) immunoassays that change color in the presence of fentanyl dissolved in water. Inspired by their simplicity, clinics in Vancouver, Boston, and New York have all begun distributing the strips to users. The new study, released in two parts, sheds experimental light on this question. It looks at a cohort of about 90 young (ages 18 to 35) users of heroin, cocaine, or pills in Rhode Island, examining how their behavior changes when they are given fentanyl test strips. In the first part of their study, the authors administered a survey to their participants about their past drug use, experience with overdose, preferred techniques to avoid overdose, and willingness to use the strips. Seventy percent of the participants were concerned that their drugs might be adulterated with fentanyl, and about a third of them had previously overdosed. Unsurprisingly, basically all of the participants expressed interest in using test strips. Each participant was then issued ten test strips, as well as given a brief training on how to use them properly. Most of the original participants then appeared for a follow-up survey, an unspecified period of time later, to assess how the test strips had impacted their behavior. Three-fourths of those who returned had used the strips. About half of them had shared their strips with others, and 12 percent of participants had used all ten. Among those who used the strips, half got at least one positive result, while the other half did not. There were statistically significant relationships between getting a positive result and being a heroin user, a history of injection drug use, and having witnessed an overdose or worrying about friends overdosing. The most important result, however, was that users who did get a positive result took substantive steps to reduce their risk of overdose. Forty-five percent used smaller amounts, 42 percent went slower when using, 39 percent opted to use with someone else, and 36 percent took a drug sample, a.k.a. a tester, instead. Between the first and second surveys, users who got a positive result on their test strips reported a "positive overdose risk behavior change" significantly more than those who did not get a positive result. In other words, when a user found that their drugs contained fentanyl, they took steps to reduce the risk of overdose. This is a good sign for the effectiveness of test strips, as is the fact that basically all of the returning participants said they wanted to keep using the strips. There are, of course, some important caveats. A positive result was not meaningfully associated with users actually getting rid of the tainted drugs—users still will use fentanyl-adulterated drugs to get well, just more carefully. There are also some limitations to the study's methodology: self-reported behavior is less credible than, for example, a study using surveillance of drug users. Still, the study does at least suggest that more research is merited, and that fentanyl test strips are unlikely to encourage more overdoses. Policy approaches to reducing fentanyl deaths are urgently needed; policymakers might do well to consider adding test strips to their arsenal. This entry was posted in Issues and tagged Opioids. Bookmark the permalink. Charles Fain Lehman is a staff writer for the Washington Free Beacon. He writes about policy, covering crime, law, drugs, immigration, and social issues. Reach him on twitter (@CharlesFLehman) or by email at lehman@freebeacon.com.